Two years ago, Manuel Ramos published Desperado: A Mile High Noir. In 2014, that title earned Ramos the Colorado Book Award for best mystery–the latest award in an ongoing collection of honors. 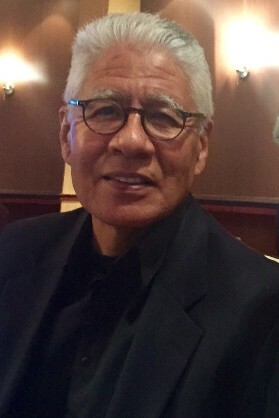 Ramos’ first novel, The Ballad of Rocky Ruiz, was a finalist for the Edgar award from the Mystery Writers of America and also won the Colorado Book Award. Set against the gentrification of north Denver, Desperado won praise from the Denver Post and drew considerable national attention, too. It also generated a very cool book trailer and I liked it, too. Now Ramos is back with The Skull of Pancho Villa And Other Stories and I’m here to predict he should clear some room on his awards shelf. First, Manuel was kind enough to answer a few questions in his colorful, casual style. Question: Okay, before we get to The Skull of Pancho Villa And Other Stories, I’m wondering if you know Juan Felipe Herrera? Did you know he was being considered as a US Poet Laureate? Do you have any favorite poems of his? Manuel Ramos: I personally don’t know Mr. Herrera but I’ve seen him perform his poetry and I’ve participated in events where he also was a presenter. He’s been a leading literary figure for decades; well-respected and admired; and it seems that I know dozens of writers, poets and otherwise, who were students of his or have been influenced by him in some way. The Poet Laureate announcement was a pleasant surprise for me and universally applauded by everyone. He’s getting well-deserved recognition. I’m not sure about a favorite poem of his, but don’t overlook his children’s and young adult fiction – check out Crashboomlove: a Novel in Verse. Excellent. Question: Where is the actual skull of Pancho Villa? Also, why is that there is often so much mystery and intrigue about the corpses of legendary revolutionaries? Manuel Ramos: The mystery of Pancho Villa’s skull has not been solved. Thus, stories multiply and the legend grows. Somewhere, someone has the relic – maybe under lock and key at a prestigious Ivy League school, maybe in the trunk of a tricked-out ’64 Chevy Impala driven by a lowriding cholo. Until it’s unearthed, it provides juicy inspiration for story tellers, fiction writers, and other liars. It’s true, isn’t it, that the remains of outlaws and outcasts often are idolized, even romanticized? Some of that must come from the reluctance of followers and true-believers to give up the ghost of the hero. Some of it has to do with the “martyr” mantle that graces many dead revolutionaries. Che Guevara, for example, or Pancho Villa’s contemporary, Emiliano Zapata. And then there are the treasure-hunters and crass exploiters – anything for a buck, including defiling a grave or selling morgue photos of assassinated champions. My generation of Chicanos revived the history of men like Villa and Zapata and, in the U.S., transformed the revolutionaries into icons for the political and sociological struggles of our youth. So, in a way, Chicanos also dug up Pancho’s remains and put them back on display, but we did it with respect and pride. Question: This collection of short stories demonstrates such a range of styles—sketches, some genuine “gotcha” endings, flash fiction, a few pieces that are more mood than plot. How do you know when you’ve got a short story idea and that it’s something you want to pursue? Manuel Ramos: Tough question to answer because I haven’t really tried to analyze my writing process too deeply. I often feel that the writing “just happens.” With plenty of hard work, that is. The character builds in my imagination until I feel that I can say something dramatic or unique about him or her. I keep notes about the character until the notes turn into something longer, and the story begins. Most of the time a completed story will result, but there are false steps and dead ends, of course. Question: First person or third? How do you decide? Manuel Ramos: I usually write in the first person, especially my longer works. First person is restrictive and requires a soft touch, but it does allow me to get up close and personal with my main character. The kind of crime fiction I write, noir included, lends itself quite well to the “interiority” of first person. First person allows me to reveal the character’s strengths and weaknesses in creative ways, but it also provides the reader with opportunities to see things that the character doesn’t realize or doesn’t want to realize. And the reverse is true – the character can hide certain things, even lie to the reader, all under the guise of telling a story. I hope it works. Third person is more expansive, obviously, and I find myself using this method when I think the story needs a broader canvas, or when certain things need to be shown but only an omniscient narrator can do it. My latest project is a bit of an experiment with point of view – that’s all I can say now. Question: Okay, I’ve picked up Roberto Bolaño and considered diving in. His works look daunting, but everyone I know raves about the experience of reading his works. Thoughts? Manuel Ramos: Yeah, daunting. I’m no expert on this writer, but I can talk about my experiences with and reactions to his writing. When I first discovered Bolaño, I felt like someone ripped a mask off my eyes. He pushed the boundaries of fiction in ways that I don’t think many others were doing or even dared to try. He was experimental without being pretentious; clever, but not quirky. I read his books as soon as they were published in English (all after his death, I think,) and I was not disappointed. I absolutely dug his short story collection, Last Evenings on Earth. But I did reach a wall with him, probably around the time of the release of the translation of The Savage Detectives. However, since then, I’ve read more of his stuff (The Third Reich, for example, as well as several short pieces that periodically are “discovered” and published.) I expect to tackle 2666 one day. No really, I do. Manuel Ramos: The story behind the story is that it was picked up by Juan Bruce-Novoa, one of the few genuine Chicano literary critics. Juan was an intellectual. He developed Chicano literary theory at a high level. He taught his theories and analyzes at the university. He produced seminal literary essays, and wrote articles and books on the history and theory of Chicano literature. He interviewed hundreds of writers, which he preserved in books, and he published his own fiction. He also was the judge of a national literary contest where I won first prize, for my first novel, The Ballad of Rocky Ruiz, although at the time of the contest the manuscript was entitled El Corrido de Rocky Ruiz. Years after we first met, Juan wrote an article for the magazine Voices of Mexico that he titled New Chicano Literature: Manuel Ramos. I thought the article was cool, of course, and felt honored that Juan picked me as a topic. The icing on the pan dulce was when he said that the magazine editors had agreed to publish one of my short stories to go along with his piece, and did I have one? I came up with Murder Movie and Juan gave it the green light. It was a big deal for me and I was very grateful to Dr. Bruce-Novoa, and regret that he passed away before we could work on more projects together. Question: Care to point us to writers, overlooked or not, who inspire you today? Manuel Ramos: I’m often inspired by the writers I’m currently reading. By “inspired” I mean I’m spurred on to try to create something that will hold a reader’s attention as much as mine was held by the particular writer. Today that includes Héctor Aguilar Camín (acclaimed Mexican author whose books are finally being published in the U.S.—I’m reading an advance copy of Death in Veracruz, one of his classics, which will be published in October), Elmore Leonard (novels from the 1970s when he was still developing his crime fiction voice,) Georges Simenon (Maigret, naturally,) Ross Macdonald (like West Coast jazz; his books should have Art Pepper theme music.) Tomorrow it might be Kathleen Alcalá, Gary Reilly, or Ernest Tidyman. Question: In “The 405 Is Locked Down,” a writer is tempted to head to Los Angeles on the notion of potential for a movie offer—though it’s vague what might come of it. Been there? Manuel Ramos: I’ve been there, but can’t say I did that exactly (i.e., what happens in the story.) Options have come and gone. A few scripts have been written. That’s it. Never had a producer pass out at dinner. Manuel Ramos: I’ve finished my working draft of my next novel featuring Gus Corral and Luis Móntez. Have high hopes for the book as I take a few (writing) gambles and break some rules. My agent is giving it the once (and twice and thrice) over. And I’ve started thinking about a short story for a proposed collection to which I’ve been asked to submit – but that hasn’t reached the pen-to-paper stage yet. Also, from somewhere, an idea has been floating in and out, all around me, about seriously damaged people, people we may not want to know in real life, who cope and carry on and get a job done. Not sure where that will go, but it should be interesting to find out. 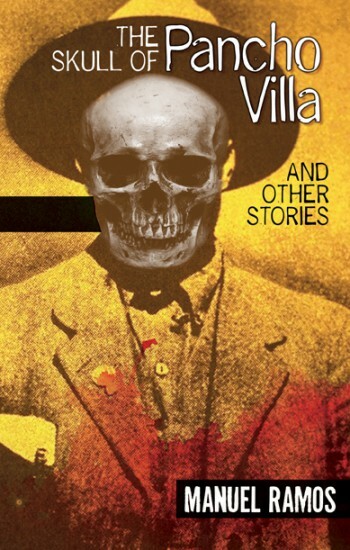 The Skull of Pancho Villa And Other Stories is a full-flavor variety pack of styles and moods. One story might pack a punch, the next might move your heart. This collection is a Manuel Ramos master class in effortless, engaging prose—no pretensions, all story. The scenes are frequently downbeat—but not all. The characters hang or thrive on the fringes and in the shadows—but not all. Most are set in Denver—but not all. L.A. shows up and El Paso, too. Most of these stories move in a world of green chile and sausage sandwiches, bar tops and back alleys, Tecates and Coronas. In “No Hablo Inglés,” disbarred lawyer Manolo is hungover in a town he hates “but that wasn’t El Paso’s fault. I hated myself and that meant I hated wherever I woke up.” Manolo’s world is about to go south. In “White Devils and Cockroaches,” González is “damn good legal aid lawyer” but finds himself representing “crazies, weirdos, misfits, losers and plain folks who got taken.” His latest client works as a dishwasher at the White Spot. González, in short, is not the slick wolf of Wall Street. He’s the scraggly coyote of Capitol Hill—and he’s pretty damn close to his breaking point. “When the Air Conditioner Quit” (one hilarious title) starts with a gunshot but that isn’t the only violence in this taut seven-page story of street rules, deception and nasty surprises. There are 23 three stories in four sections—Basic Black, Outlaws, Lovers and Chicanismo. One of the 23 is a poem (“The Smell of Onions”) but It starts with a line that is pure short story: “Shorty stumbled from the Rainbow Inn/Jenny would give him hell again.” That is a great opening couplet with a wonderful rhyme: and how can you not read more? I particularly enjoyed Ramos’ first-person stories, like the whole chunk (Chapter 5) from “Desperado—A Mile High Noir” that is a stand-alone tale in the title story here, “The Skull of Pancho Villa.” In first-person mode, Ramos goes into ultra-glide mode with his prose, so smooth and unassuming and laid-back. “You’ve heard the story, maybe read something about it in the newspaper or a magazine. How Pancho Villa’s grave was robbed in 1926 and his head taken.” This one is rife with the wry humor of Gus Corral, who may or may not be telling the truth. Ramos makes it look easy. There’s no way to wrap these stories in one box with a neat bow, and that will keep you turning the pages. Some feature writers and lawyers (particularly in the “Bad Haircut Day,” a wonderful tale of street ethics) from mainstream society and several are creative, brisk sketches that show a poet’s heart. But when Gus Corral turns to the audience for a comment in “The Skull of Pancho Villa,” he sums up the feeling I get from many of the stories in this anthology, which gathers gems from nearly 20 years of Ramos’ works. True fact—I don’t live in these worlds. But Ramos is our tour guide. And for that we can all be thankful. With extra hot green chile on top. This entry was posted in Books and tagged Fiction, manuel ramos, short stories. Bookmark the permalink.